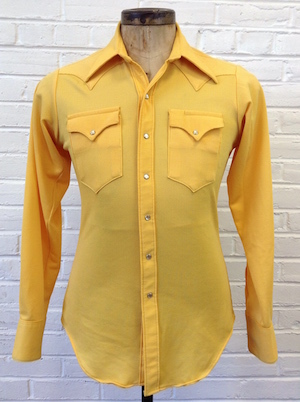 (S) Mens Vintage 70s Western Disco Shirt! Ribbed, Bright Golden Yellow! 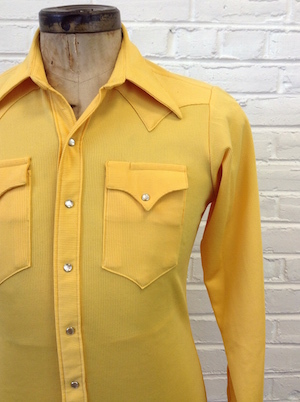 Home > Vintage Western Shirts > XS & SMALL Western Shirts > (S) Mens Vintage 70s Western Disco Shirt! Ribbed, Bright Golden Yellow! Mens Vintage 1970s Western shirt! Bright, golden yellow with a ribbed texture. Perfect for an Urban Cowboy look! Closes in the front with pearly white western snaps with four more on each cuff. Two pockets on the chest, each with pointy, western style flaps and pearly snap closures. Shirt has a tapered hem. Tagged by Rockmount Ranch Wear. No material tag, but feels like polyester. Condition: Very Good. Has an extremely faint, gray-ish mark on the lower right, front of the shirt and a tiny bit of very faint gray around the edge of the right cuff of the shirt. Does not detract from the awesomeness of this shirt!